Solstice is a June 1990 NES adventure game where you explore a gigantic castle, tackling the enemies, obstacles, and puzzles in each room. The game's isometric platforming didn't help matters, but the rockin' soundtrack certainly did. The goal? Rescuing a kidnapped princess, of course. Best 100% Time: 0:12:22 by Patrick 'PJ' DiCesare on 2013-07-21. Best Time: 0:05:58 by Patrick 'PJ' DiCesare on 2014-02-20. Best Low% Time: 0:06:38 by Patrick 'PJ' DiCesare on 2015-09-28. 100% is an incredibly fun category for this game. I never thought I'd enjoy it, but wow! This is really fun! There are so many cool rooms to visit, lots of really impressive maneuvers, and a lot to remember. I thoroughly enjoyed this process. 100% in Solstice is game-defined. I must collect all collectable items and visit every single room to obtain 100%. This includes potion refills, extra lives, continues, keys, staff pieces, and detonators. I suppose I should give some background on some stuff in this game, since I didn't in my any% notes and since this category actually uses everything. In short, you need to collect the 6 staff pieces to open the final door of the game, which leads you to the ending. Once the staff is complete, you are invincible to enemies but can still die to spikes (it is basically an eternal blue potion). The keys you collect along the way do different things in different areas. Some keys create blocks that are necessary to advance in the game. Other keys open up doorways that are needed. Basically, you need to collect these but you don't need to actively use them. Detonators open secret passageways. I believe there are 3 detonators in the game. -Blue/purple: Invincibility. Enemies cannot kill you, but spikes still can. This only works for the room in which it is cast. It is absolutely necessary to use the blue potion to beat the game. You must jump off enemies in some rooms to advance. -Pink potion: The destroyer! This kills every sprite that is on screen. This includes enemies, moving spikes, and items. Yes, you can destroy staff pieces with the pink potion. Fortunately it respawns after you reload the room. This is a very very useful potion for skipping having to wait for some spike cycles. We can just destroy them and run right through. -Yellow potion: Time stop. This freezes all moving enemies/spikes/platforms/blocks in place. This is incredibly useful for doing block jump chains without having to worry about grabbing them mid-air while they're falling. It is also really useful for stopping platforms in place in difficult rooms and freezing enemies in place if you have to jump off of them. Very good potion. -Green potion: The revealer. Allows you to see invisible platforms. Never ever used in a speed run because you simply memorize where invisible platforms are. They always appear if you land on them, so it's no big deal. Very useful for casual play though. That covers the items. There are a few gameplay things I want to cover quickly. You can pick up blocks by standing on them and pushing the B button and you can place a collected block by again pushing the B button. You can pick up a block at any point when you are standing on it. You can grab/place blocks in mid-air, but you MUST actually be on it to pick it up. You can also pick up a block AND jump off of it at the same time if you push B and A together. By combining all of this, you can do some pretty intricate maneuvers. I do a lot of "double block jumps" in this run; this involves grab-jumping a block on the ground, placing it in the air, grab-jumping it again, placing it again, and then jumping a third time. The timing is pretty tight on the mid-air grab because you are not always in contact with the block; the block falls first, and then 2 frames later Shadax falls onto it. Then the block falls again. So if you randomly guess, you have at best a 50% chance of grabbing a block while standing on it in mid-air. If you learn a steady rhythm, it is possible to do consistently. The other part of this is that blocks continue to accelerate until they hit the ground, even if you pick them up. So during a double block jump, the block falls pretty slowly for the first grab-jump. For the final jump though, the block is falling so fast that Shadax is only in contact with it for two 2-frame intervals before it hits the ground. Triple block jumps are therefore extremely risky and never made it into my route. Long-winded explanation, but I wanted to leave some info here in case anybody wanted to learn the game in the future. The only other trick I want to mention is the spike jump. Spikes normally kill you if you touch them, but you can get around that with a very precise jump. If you press A on the frame that you move into the outermost pixel of a spike, you will jump. Seems complicated but it's not. All of those details are important, though. If you fall directly onto the last pixel of a spike, you will die. You must move into it from the side. You'll notice I am always in motion during my spike jumps and that is why. Holding the A button eliminates the need to try to time the jump off the spike, since it will autojump when possible. So you basically just have to find a setup that works for you. For example, in my last spike jump in this run (green-palette room with moving platforms and a yellow potion), I line myself up on a certain pixel, and then press and hold "down" + A. Guaranteed every time. Ok. That's enough "general info". This run is really really good and came as a total surprise. I was doing practice runs for SGDQ 2013, and I think this was the 7th full run of the night. My PB before this was like 12:52 or something, with like 3 deaths. I got like halfway through this run and then realized I hadn't yet died. Haha. So then I decided to change some of my route to be a bit safer (I removed some of the spike jumps that were just for style, and a few suicide strats that only save a second or so), and tried to just get a deathless run. The result is what you see here! 12:22 with no deaths. This was my first ever deathless completion of the game, even casually! I cannot express how lucky it was that I got this run. Haha. I am still yet to get a run within 30 seconds of this. There are a few minor mistakes here and there (the credit jump before the 3rd staff piece, the jumps in the 5th staff piece room, etc) but overall this is a very strong run and I'm really happy with it. This is just over 2 minutes faster than Lucid Faia's run. A lot of this is just from much faster and more dangerous routes within the rooms themselves, but I did also use the TAS route instead of the route he used for room order. There are still a lot of rooms that are not optimal, mostly because I was trying to just get a deathless run. Some of the more optimal strats can be seen in my SGDQ 2013 run. It's just a second here and there that would add up over the course of the entire run. The biggest strat improvement is probably in the very last rooms (the room beneath the pyramid), but I will never try that in a run. If I come back to improve this, I'll probably shoot for sub-12. I'm not sure if I will try it though. This game is extremely unforgiving. Thanks to everybody who supported me and allowed me to vent during the routing/attempts of this! I appreciate the help. I hope you all enjoy the finished products. I really enjoyed learning this game and doing attempts; I'll probably return to this game eventually even if I can't actually succeed in improving this run. Big shoutouts to everybody who keeps things running smoothly at SDA! Also a big shoutout to ballofsnow for making Anri-chan, without which I would be totally lost when it comes to encoding videos. The biggest thanks of all goes out to all the TASers of Solstice, in particular AndiHoffi and Randil. I more or less stole their route and then adapted it for real-time play. Lastly, thanks to Lucid Faia for motivating me to pick up this game. 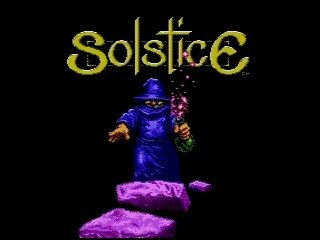 Solstice is a game I never really made any progress in as a kid, but still loved playing. The music was really great, the controls were really tight and responsive, and it was just a cool game. And it's one of the most recognizable isometric games, which is pretty awesome too. When I got into speed running, I eventually found Lucid Faia's runs of this on SDA and was pretty impressed by how quickly it can be beaten if you know where to go. The super-cocky comments left a really bad taste in my mouth, though, so I decided to pick it up and see what I could do with it. After adapting some of the TAS tricks and rerouting any%, I was able to beat his 6:23 on my first attempt, with a death. I slowly improved this to a 6:03 but it still had a death. I couldn't bring myself to work on this anymore and switched to 100%. After my SGDQ 2013, I was kind of burned out on it and didn't want to try to improve any%. On 2-19-2014, I decided to relearn the route and try to finally put this to rest, and I surprisingly was back in shape after an hour or so of grinding. ~200 attempts later, I got this run! I'm not quite as efficient as Lucid, though. He got his run on his first try, and this one took me a total of 720 attempts. This clocks in at 5:58, making it ~25 seconds faster than Lucid's run (despite it being "one of the cleanest speed runs [he's] ever seen, for any game". This is also my second ever deathless run (the first deathless run being my 12:22 100% run). Ironically, this any% still has some major mistakes! I just really cannot bring myself to work on this any more though, so I am submitting it for now. I'll come back to work on it later I'm sure. -The biggest mistakes of this run are in the two consecutive rooms leading to the 4th staff piece (in the yellow-palette area). I failed to land on a block twice, and then missed the double block jump once. I followed that up by missing the spike jump like 5 times. This is a combined 8 second mistake. The best part is that this run is 8 seconds off of my "sum of best splits". That should show you how strong the rest of the run is. -The solution for the room before the final staff piece was not intended to be used in the route. It is a frame-perfect mid-air block grab followed by an extremely precise block jump through the pyramid floor...which has a random chance of failing based on where the block is placed. It saves ~3 seconds over the traditional strat, though. Considering how bad that previous mistake was, I decided on the fly to attempt this strat and somehow succeeded. -There are two strats I omitted in the yellow-palette area. In the first room in which I use the purple potion (with the two spike blocks on either side of the corridor), it is possible to just spike jump onto the pillars on the side and go around the troll and spikes. This saves one menu (~0.7 seconds). In the 4th staff piece room shortly after, you can do an INCREDIBLY hard triple block jump to avoid using the yellow potion. I do this in my SGDQ 2013 run somehow, but it is way too inconsistent for a run. It saves just over a second. However, it is a blind, frame-perfect, luck-dependant trick. -In the room right before the 3rd staff piece (purple-palette area with a tall divider), I can jump directly off the credit as it is falling without repositioning it first. This saves a significant amount of time (a little over a second), but I was never able to find a consistent setup for it. I may look into this when I try for an improvement. So yea. If I repeat this performance but without those mistakes, I'd be looking at a 5:50. Adding the other insanely risky strats, I might be able to get a 5:47. Realistically, if I get around a 5:52, I'd be very happy. For now though, I am happy to submit this pair of runs finally and move on to other games. I strongly encourage others to pick up this game, if even just to play around with casually. It was a very, very fun experience for me and it gave me a much greater appreciation for the game. I'm looking forward to returning to this game after a break. Low% in Solstice is game-defined. We are simply trying to achieve the lowest in-game percentage possible without using cheats or the password. It would be possible to cut nearly 1 full percentage point off the best low% route by using the potion/lives code, but I do not believe in using cheats for speedruns. Every unique room visited adds 0.19% (IIRC), and every item collected is worth 5 rooms of percentage. This presents an interesting optimization problem. Since I am most concerned with minimizing percentage, I am not worried about taking a long time to backtrack through previously-visited rooms. In many cases, collecting a key will open up new passages that make a more coherent path through the castle. A key counts as an item though, so unless the key allows me to skip more than 5 rooms, I do not collect it. The only optional item that I collect is the credit. I need to collect more blue potion at some point, because two blue potion uses are mandatory to complete the game, and using 2 extra blue potions allows me to skip something like 16 extra rooms. I can get a potion refill through either collecting a blue potion or by game overing and continuing. Both a blue potion and a credit count equally as 1 item, and since there is a credit in a room I already visit, it gives me a lower final precentage to collect that, game over, and continue. The deaths in the run are the most optimal deaths I have been able to find. The final total should be 99 rooms, 29.10%. It might be possible to get lower, but this is the best route that we (Breakdown, me, Blechy) could come up with. Big thanks to the gentlemen mentioned above for helping me with the route for this, and to Murphagator for planting this stupid idea in my head in the first place. This is an exceptional run. There was a bit of a fiasco in the worm room with the staff piece and one missed block grab in the room preceding it, but those are essentially the only mistakes in the run. This is an incredibly tricky category to execute, and I couldn't be happier with how it turned out. I have no plans to return to this.